The Oracle Construction and Engineering Prime Cloud enables you to evaluate, prioritize, plan, manage, and execute projects and programs via an enterprise project and portfolio management solution built on Oracle technology. Oracle Prime is a 100% cloud-based, user-optimized project portfolio management product (PPM) that manages the full range of simple to complex projects of all types. 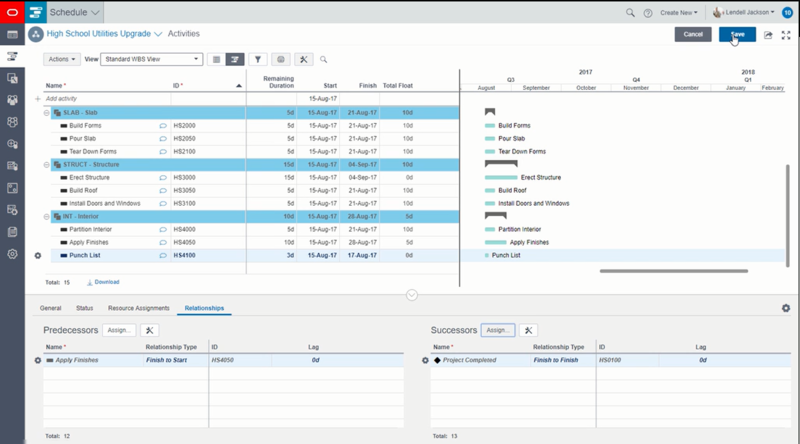 Oracle Prime Cloud enables project managers to complete projects on-time and within budget with built-in reporting dashboards and performance visualization for prioritizing, planning, managing, and evaluating projects and resources. Portfolio planners, executives, stakeholders and project managers have real-time visibility into project cost, schedule, and risk. Oracle Prime enables teams to prioritize and select projects for long-term planning efforts. The solution provides comprehensive long-range tools for capital planning and budget approval across project portfolios. Oracle Prime Cloud optimizes and integrates critical processes, scope, schedule, cost data, and documents across the organization. The application has an intuitive user interface that can be tailored to your business to increase adoption, minimize training, and deliver rapid time to value. Create multiple portfolios to analyze projects and proposals. Analyze project portfolio activity, status and customer success metrics. Share performance improvement results with key business stakeholders. In-built, configurable forms and workflow processes to address simple and complex business needs. Flexible collaboration system to improve coordination between project members. Deliver scope, schedule and cost data on a single platform to reduce complexity. Real-time insight into portfolio activity, status, and metrics KPIs to improve decision making across projects and proposals. Web-based application with zero client-side software. Leverage leading database and middleware technology. High performance, scalable, extensible and reliable system. Intuitive and flexible interface to save time and money and accelerate user adoption. Purpose built mobile application leveraging device capabilities and providing a rich, targeted user interface and experience. Offline capability to access data on the go. In-built notifications and discussion capabilities to improve collaboration. Project Partners is an authorized reseller of Oracle Construction and Engineering Prime Cloud. Our Primavera specialists can work with you to tailor the solution to meet your business needs. We can assist you with the design, implementation, and operational support of your Oracle Prime deployment. Let our experts take your Project Portfolio Management organization to the cloud. Contact us today for more information about Primavera products and services that we provide.